One of my customers came to me with the question on how this new feature called Intelligent Workload Placement in vRA 7.3 works. At that time I knew this feature was there but I wasn’t sure what it was exactly. Following up on the question I started reading about the it and it sounds like a promising feature. In a nutshell, this feature uses the analytics from vRealize Operations to recommend placement, based on the to-be situation, to vRealize Automation. vR Ops takes into account all the clusters it manages, so if you have a cloud environment with multiple vCenter endpoints, it will look at all the available clusters. Fill in the details of your vR Ops instance and test the connection. If it works click OK to save. Still logged in as IaaS admin go to Reservations and select Placement Policy. 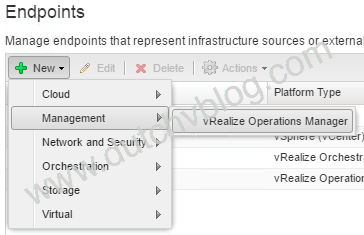 Check the box ‘Use vRealize Operations Manager for placement recommendations’ and click save. vRealize Automation is now ready to receive recommendations from vR Ops. Log in to vR Ops as an administrator and go to the Administration tab and select Solutions. Here you will find the vRA solution that we need to set up. Select the VMware vRealize Automation solution and click the gear icon at the top to configure the solution. 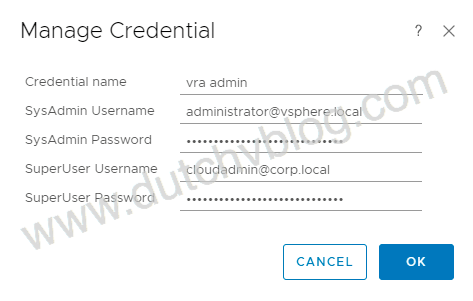 In the screen that opens fill in the details for your vRA instance. Setup the credentials to use. With all detailes filled in test the connection and if everything is working click safe and close the config screen. After setting up the vRA solution we can continue with the policy that determines how the load will be spread across your clusters. In my case I have just edited the default vR Ops policy that is active in my environment. The better way to do this might be to create a custom group that will have all monitored clusters in it and apply a new workload automation policy to this group. Go to Administration -> Policies -> Policy Library and edit the policy you want to use. With the policy settings windows open go to section 4, Workload Automation. Here you ‘unlock’ Consolidate Workloads to override the default and move the slider to Maximum. Consolidate Workloads is the policy that affects the vRA placement integration. This setting is essentially an on/off switch. If you choose None, it will balance the workloads across clusters. If you choose Maximum, it will fill the busiest cluster. It will continue to either find the most balanced or busiest cluster until it cannot find one. When vR Ops cannot find a cluster that matches the policy the placement falls back to vRA default mechanics. Now that we have set up all components we can test if it actually works. Log in to vRA and request an item from the catalog. When you now check the execution details while the request is in progress you will notice a ‘Show Placement Details’ link in the request. Go ahead and click on this link. This should show you a new window with the recommended reservation which in turn points to the recommended cluster. This means that vR Ops was contacted by vRA and that it was able to successfully recommend the location that was best suited according to the placement policy. With this information vRA has tied that information back to a reservation that was setup for the cluster that was chosen. Intelligent workload placement is a really nice feature that helps cloud admins to simplify the placement of workloads across clusters and vCenter environments. Intelligent workload placement really aims to be a background feature that will silently help cloud admins with the correct placement of workloads once it is set up. This also has its drawbacks, for instance when not able to recommend a location, the feedback to the end-user is pretty poor. I found this out myself when testing this feature. My clusters were close to the threshold that vR Ops uses to calculate if more workloads will fit. When requesting a catalog item I would go over the threshold but the end-user never sees this information. The placement details window just looks like recommendations is not working at all instead of telling you that a threshold was reached and default placement mechanics are in play. It wasn’t until after I cleaned up my cluster to lower the thresholds that I started seeing the recommendations in the placement details window. If you need some more background information I would recommend looking at the official documentation on the VMware site.